The Chateau de Nice was built in the 11th century for military purposes. It is located in Vieux Nice and features on most sightseeing tours of Nice, but the fortress itself is long gone and only some ruins remain. The attraction for visitors is the Parc du Chateau (or Colline du Chateau, that is, the Castle Hill) which surrounds the former fortress. With wonderful views over the rooftops and gleaming mosaic tiles of Old Nice, along the sweep of the Promenade des Anglais and out to the Mediterranean, the Château park is a lovely attraction in itself and a good place for visitors to orientate themselves within the city. 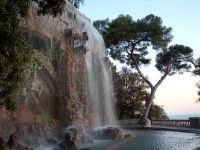 Visitors can take cool walks in the shade of the trees, enjoy the large grassy park, explore the Roman ruins and visit the waterfall; it is a pretty and peaceful place to spend an afternoon. The fortress was razed by Louis XIV in 1706 and the only part left standing is the 16th-century Tour Bellanda, a tower which now houses the Naval Museum. The cemetery where Garibaldi is buried covers the northwest side of the park. To reach the park, visitors can either climb the steps at the front, from the Quai des Etats Unis, or for those who aren't up to it an elevator is available.